Nodding Broomrape is aiennial or perennial parasitic herb, 15-30 cm tall, simple, erect, pale brownish or purplish, sometimes thickened and short. Scales are ovate to lanceolate, acuminate. Flower spikes are 10-20 cm long, often densely many flowered. Bracts are ovate to lanceolate, shorter or as long as the corolla, broad to narrow; bracteoles absent. Calyx is as long as the corolla, divided completely at the back to 2-segments; each lateral segment 2-fid to sometimes almost entire, very variable, teeth ± as long as the tube or shorter. Flowers are 1.5-2.0 cm long, usually prominently curved, hairless to velvety above, tubulose; tube often whitish or pale, hardly to slightly inflated below; limb shortly lobed, bluish, sometimes violaceous to brownish, irregularly toothed to subentire. Capsules are suborbicular, 5-7mm long; stigma usually darker, bilobed. It is a parasitic plant of Sunflower, and Solanaceae. Broomrape seedlings put out a root-like growth, which attaches to the roots of nearby hosts. 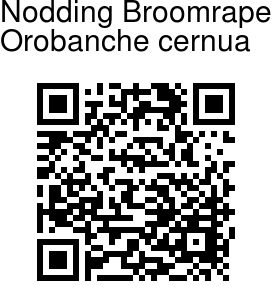 Once attached to a host, the broomrape robs its host of water and nutrients. 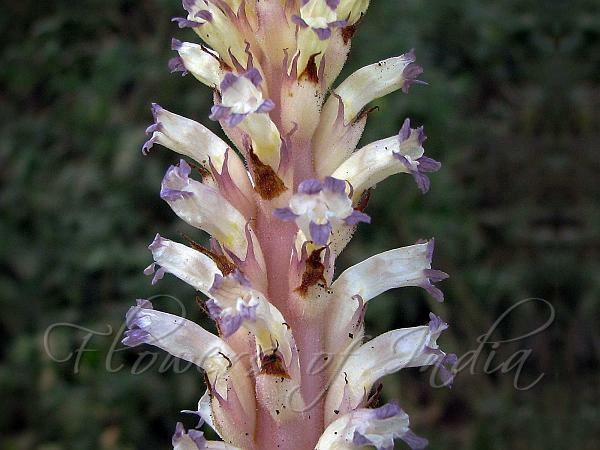 Nodding Broomrape is native to Asia, Africa.